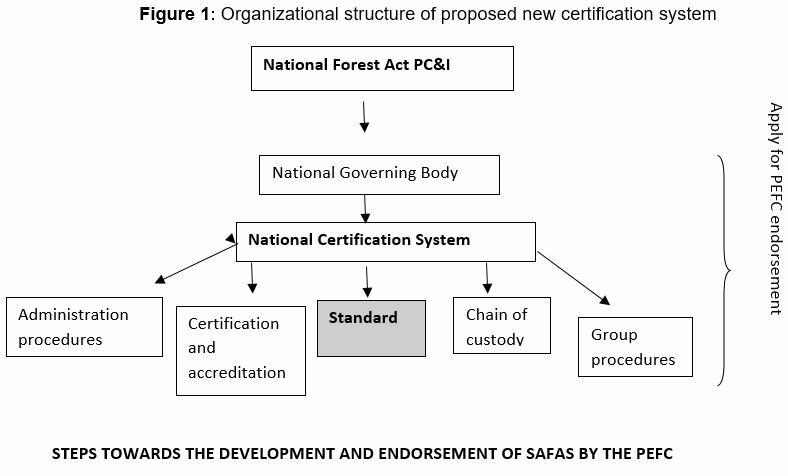 The South African Forestry Assurance Scheme (SAFAS) was submitted to the Programme for Endorsement of Forest Certification (PEFC) for endorsement in October 2017 and is currently being reviewed by an independent consultant. The objective is to have a National Certification Scheme that is based on the DAFF Principles Criteria and Indicators for sustainable forest management that is appropriate for all scales of forestry operations. The goal is for forestry certification to be a tool for improving forest management and facilitate access to markets that require certification. Currently about 80% of South African plantations are certified under the FSC system but very few of these plantations are on private farms or in communal areas. As the demand for certified products increases, both abroad and locally, certification could become a trade barrier to smaller management units. This is a concern for the entire timber industry as most timber growers supply common markets. In addition, South Africa's land reform programme is likely to result in a greater proportion of the plantation estate being managed by smaller scale timber growers. It was felt that a National Standard that is more sensitive to the needs of the smaller scale forestry operations is needed. The standard forms part of the policies and standards of SAFAS which is administered by a National Governing Body (NGB) which is a member of the PEFC. The scheme will allow forestry operations of all scales that comply with the standards and scheme's requirements to be certified under SAFAS and once endorsed by the PEFC be recognized as certified by the PEFC. The Environmental Committee of Forestry South Africa (FSA) tasked a Steering Committee to develop a certification system that could be endorsed by the PEFC. This Committee suggested using the National PCI&S Framework as a basis for developing an auditable standard. The National Forest Act of 1998 binds forestry operations to principles of sustainable forest management and promotes the development of a system of Principles, Criteria, Indicators and Standards (PCI&S) for sustainable forest management. The current set of PCI&S is the result of an intensive review process of the second edition of the manual (2007). Establishment of a National Governing Body (NGB) responsible for the governance and administration of the system. This body will include broad stakeholder interests and will oversee the system. (Figure 1). The NGB will apply to become a member of the PEFC. Formal approval from government for the use of the National PCI&S Framework for the purpose of developing the standard. Gazetting of the PCI&S Framework for public use. Development of an auditable standard using PCI&S Framework as a template. Development of certification, accreditation and chain of custody procedures. Development of Group Certification Procedures that will enable Smallholders to achieve certification (risk based certification of landscapes).